a new TWIKE adventure in 2015! TDB2015 will take us further afield than any previous trip in our 8 year history, except the one across india. detailed planning of our route will start in february 2015. Since we’ve gotten tired of investing 2 of our precious driving days getting in and out of switzerland (with all our tours and other, smaller trips, we’ve more or less covered all routes in and out of switzerland. this is why for TDB2015 we’ve decided to have TW560 shipped to our starting point by truck. update 24apr15: we will not be shipping tw560. jc will take the twike to tallin himself on TDB2015’s prologue. should you know any POI’s along our route – as always – let us know! want to start reading about TDB2015? start here if you want to read about our preparations. 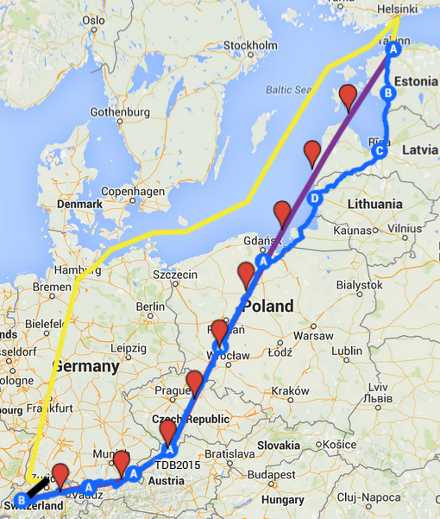 go to the first entry for TDB2015’s prologue to tallin.